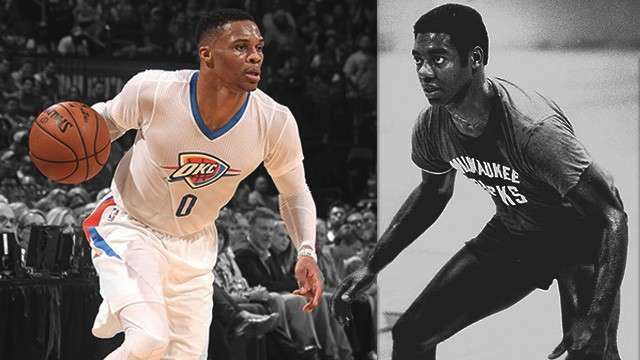 It took only 22 minutes for Russell Westbrook to register his 41st triple-double, which tied NBA legend Oscar Robertson's record for most stat-stuffing games in a single season. The Oklahoma City Thunder guard ended up playing a total of 27 minutes in front of the home crowd and racked up 12 points, 13 rebounds, and 13 assists in a blowout win against Robertson's former team, the Milwaukee Bucks, 110-79. After Westbrook clinched the mark early in the third quarter (9:17 left), the play was briefly stopped for the feat to be recognized. He waved to the crowd's standing ovation and MVP chants. His 78th career triple-double also put Russ in fourth place all time, tying him with Wilt Chamberlain behind only Jason Kidd (107), Magic Johnson (138), and 'The Big O' (181). With still five games remaining this season, he is on pace to not only break the record, but also become the second player in NBA history—other than Robertson—to average double figures in three statistical categories after 82 games.